Well, I've finally found a favorite biscuit recipe!! I copied this "Fluffy Biscuits" recipe from a Taste of Home cookbook. I'm thinking the egg makes the difference from most biscuits I've made...? Small TIP from Bobby Flay: when placing biscuits on your baking sheet, keep biscuit edges touching. This helps them rise higher. In a small bowl, combine the flour, baking powder, sugar, and salt. Cut in shortening until the mixture resembles coarse crumbs. Beat egg with milk; stir into dry ingredients just until moistened. Turn onto a well-floured surface; knead 20 times. 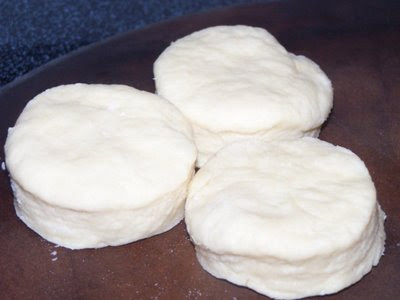 Roll to 3/4-inch thickness; cut with a floured 2 1/2-inch biscuit cutter. Place on lightly greased baking sheet. Bake at 450 for 8-10 minutes or until golden brown. Serve warm. Mmmmm! Nothing quite so deliciously comforting as a warm, flaky biscuit slathered in butter and jam!! What's the difference between biscuits and scones? Those look SO good! I haven't made biscuits for a long time! Oh those look soooooo fluffy and yummy. Come make some for me, pretty pleeeeease? These look so good! How many does a batch make? OK this may be a dumb question, but what is shortening? I know how to use butter and margarine. Shortening is a solid vegetable fat, the most common brand is Crisco. In the US, shortening can be found in the baking aisle. You can substitute butter, margarine, or lard in most recipes calling for shortening. 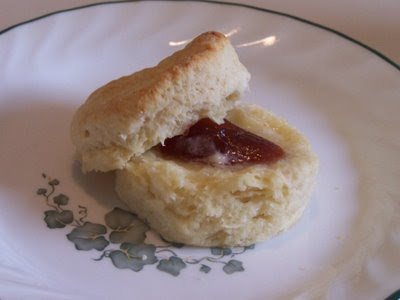 In this biscuit recipe, I often use half butter/half shortening for a super flaky and buttery tasting biscuit. Now I want some biscuits! :) I'm going to have to try this and replace the shortening. I haven't used shortening in years... that's how my grandmother taught me to cook. :) ... I feel like going in the kitchen right now and gather up the ingredients. Wait, "feel like" may be the wrong phrase, but you know what I mean. LOL. Thanks for the recipe. I'm going to be trying these soon. Maybe tomorrow morning... sound good with coffee, huh? I made these but mine didnt rise as much. maybe I rolled them out thinner. I also didnt know i should make them touch. the flavor was great even though i added less sugar because i didnt want them too sweet. i will make again and try new tips. Hi, Rach! I'm glad you gave them a try! 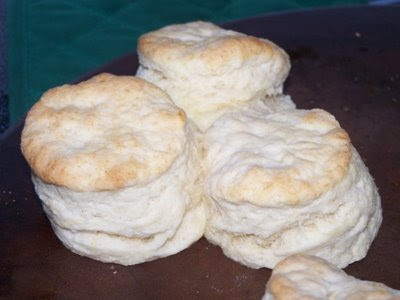 They really are my favorite biscuit recipe, and I love the flavor! I hope you'll give them another try and let me know how they turn out!